The 19-year-old girl from Thrissur recently posted a photo on her Instagram where she and Roshan were seen romantically gazing into each other's eyes. Malayalam actress Priya Prakash Varrier, who became an instant internet sensation with her wink and smile, will soon be making her debut with Oru Adaar Love. And before once again, the winking girl is breaking the internet and this time for his cozy picture with her co-star Rohan Abdul Rahoof. The 19-year-old girl from Thrissur recently posted a photo on her Instagram where she and Roshan were seen romantically gazing into each other's eyes. The photo, which showed us a glimpse into their adorable chemistry, has now gone viral on social media from the moment it went online. Priya Varrier is one of the popular social media star and has 6.4 million followers on her Instagram page. She is also on the wish list of popular brands for endorsing their products and get wider reach on social media. Apart from her Malayalam debut, she will also be making her Bollywood debut with Sridevi Bungalow which has been written and directed by Malayalam filmmaker Prasanth Mampully. Sridevi Bungalow has ran into trouble with Boney Kapoor ever since its first trailer was released online a few days ago. The filmmaker has sent a legal notice to the makers without seeking his permission to produce the film and showing similar circumstances to the life of legendary actress Sridevi and her unnatural death due to accidental drowning in a bathtub. The film's director Prasanth Mambully, on the other hand, has remained unfazed with Boney Kapoor's angry reaction and defended himself by saying that Sridevi is just a name of the character in the film. Priya Prakash, on the other hand, said, "I think the curiosity surrounding the trailer is good and we have to leave it to the audience to judge if the film is based on the veteran actress Sridevi ma'm." 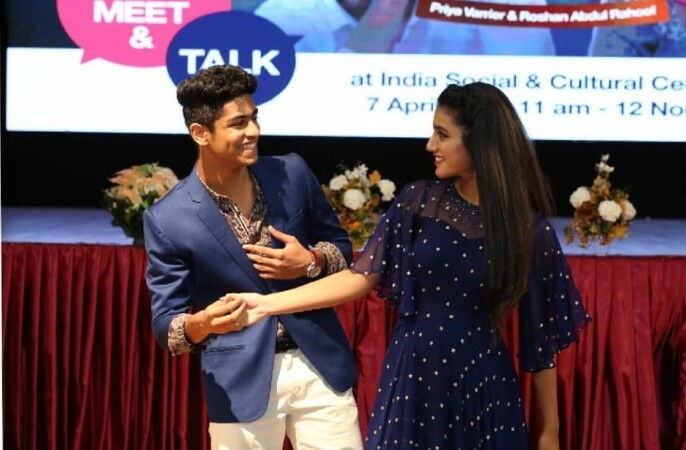 Meanwhile, take a look at Priya Varrier's photo with Roshan which is taking the internet by storm.